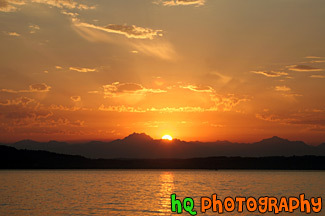 A scenic picture taken of an orange sunset looking at the Olympic Mountains in Washington State. This photo was taken across from Seattle at Alki Beach. You can see the sun's reflection in the Puget Sound as it falls behind the mountains.